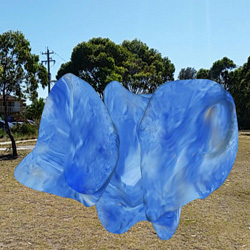 From February to April this year, the sixth installment of (Un)seen Sculptures, a mobile 3D augmented reality art show, was presented by dLux MediaArts and Bega Valley Regional Gallery. The exhibition was staged at locations in Bermagui, Merimbula, Bega and Eden. Situated at each these locations were virtual digital works; hidden from the naked eye but visible to anyone with an iPhone or Android smartphone and an app called the Layar Augmented Reality Browser, that can be downloaded for free from the iTunes App Store or Google Play Store. As with previous shows, there were works by Australian artists and international visitors from USA, China, and Germany. This time around though a workshop on augmented reality techniques was held prior to the show and out of this came two works by local artist, Gordon Beattie, which featured as part of the show. For more information about previous showings of (Un)seen Sculptures, click on the 2014, 2012 or 2011 link at the top of this site. 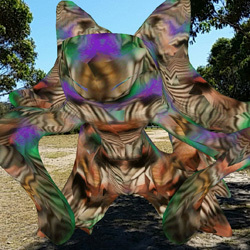 If you’re intrigued by mobile augmented reality art in general, and want to find out what’s been done in this field elsewhere in the world, follow some of the links in the AR Art Links box in the sidebar on this site.